COLORADO SPRINGS, Colo. (March 6, 2014) ––STORServer®, a leading provider of proven data backup solutions, today announces that the STORServer Enterprise Backup Appliance (EBA) 2202 has received the only “Best in Class” designation in analyst firm DCIG’s 2014-15 Integrated Backup Appliance Buyer’s Guide. Out of 72 integrated backup appliances evaluated, STORServer’s EBA 2202, powered by CommVault (EBA 2202-CV) achieved the highest ranking in the Buyer’s Guide for demonstrating impressive scalability, exceeding 1.4 petabytes of disk storage with additional tape storage if needed, and placing near the top in all four categories in the Guide: hardware, management, software and support. The EBA 2202-CV scored particularly well in the Management and Software categories with its Hardware score exceeded only by the EBA 3202, powered by IBM Tivoli Storage Manager (EBA 3202-TSM). In addition to the EBA 2202-CV receiving the “Best in Class” designation, the following STORServer models were all ranked in the Buyer’s Guide top 10: EBA 1202-CV, EBA 3202-TSM, EBA 802-CV, EBA 2202-TSM, EBA 1202-TSM and EBA 802-TSM. STORServer offers a data recovery guarantee ensuring that customers will not only get their data back in the event of a loss, but the data will be useable once it is recovered. In addition, the company provides every customer the opportunity to try out a backup appliance risk-free with its 30-day money back guarantee. 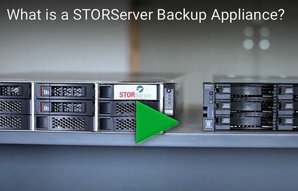 For more information on STORServer’s line of data backup solutions, visit https://storserver.com. To download the full DCIG 2014 Integrated Backup Appliance Buyer’s Guide, visit http://backupapplianceguide.com.